The eventful ascent of a doctor in the corrupted Italian healthcare system. 1849 - Ciceruacchio declares the Independent Republic of Rome, but the French and the Austrians try to bring back the Pope to Rome. 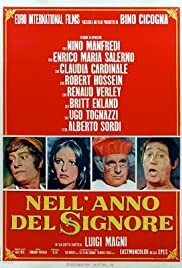 The surveyor Giuseppe Di Noi experiments the troubles of the Italian Justice System of the '70s while back in Italy for a vacation. An Italian laborer (Nino Manfredi) foils anyone who tries to stop him from selling espresso on the Milan-to-Naples train.